Grown at Hutchinson Farm since 2009. Available May 2018, in 4½" pots, combination planters and hanging baskets. Introduced in 2005, Diamond Frost is the “Most Award Winning Plant” in Proven Winners history. 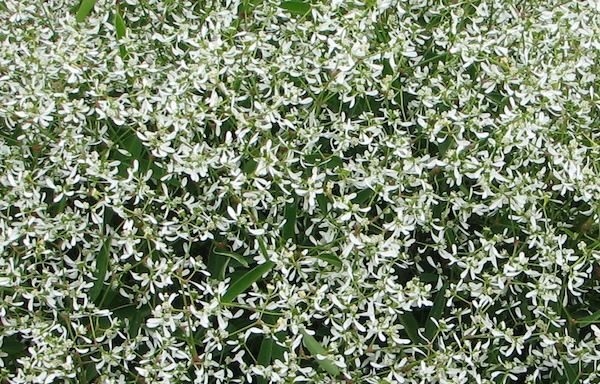 With good reason: not only are the delicate white flowers a delight to behold, it's also easy to grow, maintenance free, a continuous bloomer, heat and drought tolerant, it's even deer resistant! Diamond Frost can be grown virtually any where: In the garden, indoors as a house plant, by itself, or along side most other flowers. It excels as a filler in virtually any combination planter. Diamond Frost is in the milkweed family...break off a branch and watch the milk flow!